Distinctive features: One of a series of sophisticated calculators. This model has scientific functions and is programmable, able to store two 80-step programs. Battery powered though rather large for a hand-held calculator. Display: 12 digits, amber 'Panaplex II' gas discharge. Power supply: 4x D size rechargeable cells. Functions: Scientific programmable (can store two independent 80-step programs). Board 1) Texas Instruments TMC 1864NC, TMC 1871NC, General Instruments 8KR029, 8KR03A, Intel 4x 2102, AMD 3x 93L0059X. Board 2) Texas Instruments TMC 1866MC, TMC 1867NC, TMC 1870, TMC 1872NC. Board 3) Texas Instruments TMC 1869NC, TMC 1884NC. The latest date code in the machine illustrated is week 32 of 1973. Size: 140 mm x 230 mm x 70 mm (5.5" x 9" x 3"), 1100 g (2.5 lbs.) without batteries. 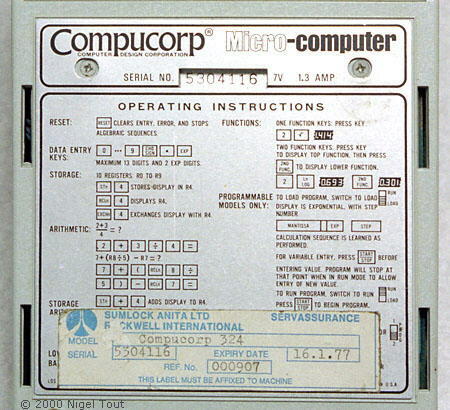 Manufacture: Made in the U.S.A. by Compucorp (Computer Design Corporation) of Los Angeles, and supplied as the OEM to Sumlock Anita Electronics Ltd.
"Each machine is 'microprogramed' with MOS/LSI logic specifically for each application. 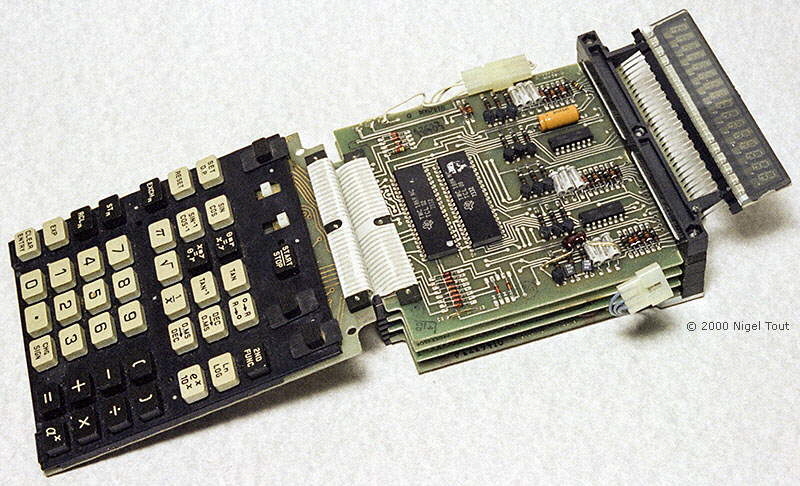 ROMs produced by Texas Instruments and AMI to Compucorp specs control the keyboard functions pre-programed by the manufacturer. Groups of calculators bearing family names such as Statistician, Scientist, Accountant, and Treasurer, are thus tailored to the user." 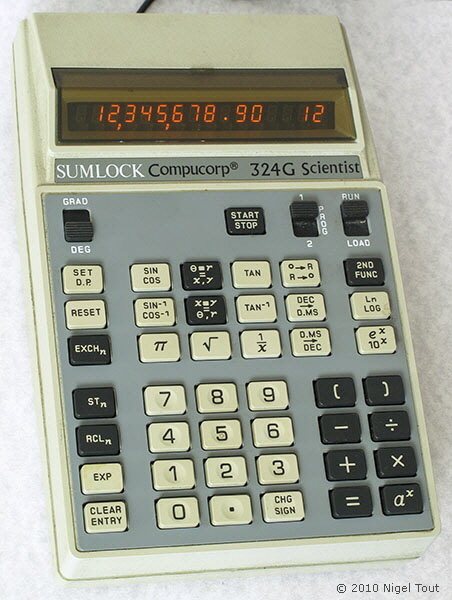 Significance: This series of high-quality, high-function, calculators looked very futuristic when they appeared with their smart and business-like design. Inside, a great deal is squeezed into a small volume, yet everything comes apart and goes back together very easily for servicing. The functionality of each machine in the series "is 'microprogramed' with MOS/LSI logic specifically for each application". Although these models can be powered by the internal rechargeable D-size batteries, their large size makes them rather a handful for a hand-held calculator, and they are perhaps more accurately called 'portable' calculators. Within a couple of years the IC manufacturers where cramming all of this functionality into 1 or 2 ICs, the cost of the competition plummeted, and the size shrank. 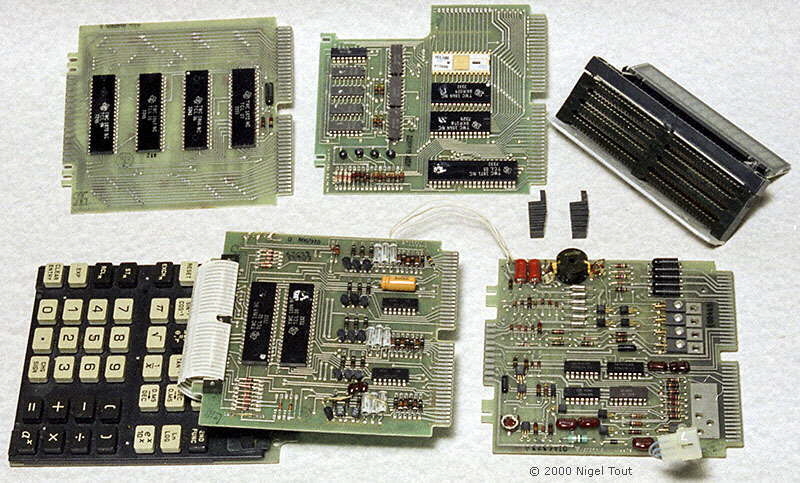 Here the keyboard and assembly of circuit boards has been removed from the casing. The four circuit boards plug into a stack of sockets, on the right, which acts like a miniature backplane and also mounts the display. The circuit boards have been unplugged from the stack of sockets to reveal the number of large integrated circuits required at this time to produce a scientific programmable calculator. The rear label, showing the high power consumption of 1.3 Amps at 7 Volts, and the label for servicing through Sumlock Anita Ltd.